Plus one: Weekday Five-ingredient Bibimbap. Thanks for holding tight, my friends. I am back with a vengeance, and this time, as I promised a billion 1.5 years ago, with a bibimbap recipe. There are a good reasons I am doing a post on bibimbap. 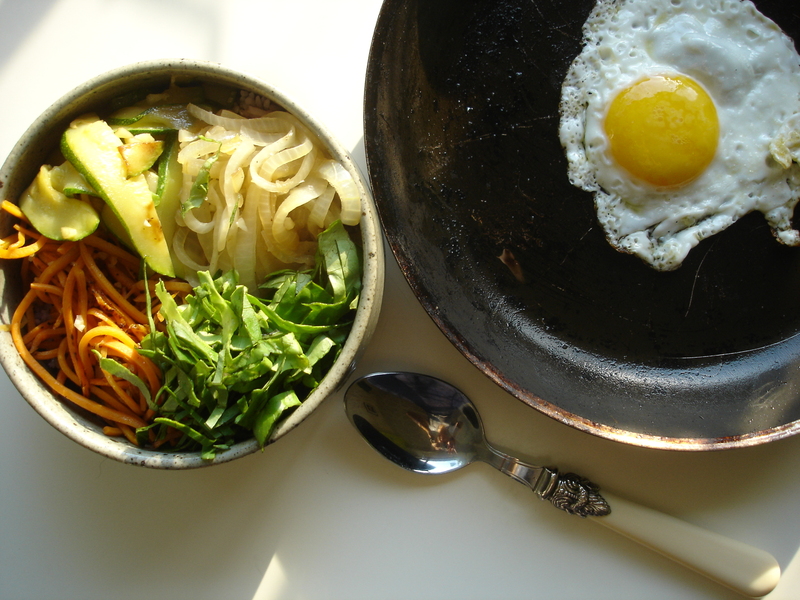 It’s not only because bibimbap is perhaps the most popular and well-known Korean dish in America. You see, I didn’t particularly grow up eating bibimbap on a regular basis. There’s nothing wrong with it but it’s just not one of those things that my mom made all the time. It’s perfectly delicious, I have no qualms against it, and am happy every time somebody else orders it and I steal a spoonful. The reason I feel very strongly that I must do a post on this, and that you MUST make this at least once, is for you to see the utter folly of spending 12 dollars on it when you are eating out. Sorry, Korean restauranteurs… I keep saying things that might put you out of business, but I have to share the truth. Hopefully the truth will not only set you free but also propel you to do creative things instead of relying on the same ol’ limp presentations of well-worn favorites. Wait.. what? Where was I? Oh yea, the folly of spending an excess of hard-earned ca$hdollaz on bibimbap. LEVEL OF EASE: as easy as boiling water. Something’s going around these days. I’ve been kind of sick recently and every time I get seriously ill, I crave what my mom made me every single time I was sick enough to actually be allowed to stay home and not go to school: rice porridge. I realize that rice porridge isn’t the sexiest sounding thing in the world, but I’d like to present to you a version that is seriously delicious, incredibly quick, and one you would easily pay good money at a Chinese restaurant for. Just so you know, rice porridge in Korean is called jook (rhymes with ‘gook’ – sorry! ), and in Chinese is called congee (pronounced like con-jee). This blog is about Korean food, so I will refer to it as jook from now on. RICE + LOTS OF WATER + FLAVORING = JOOK. Korea Day 1, Post-flight breakfast at home. Going to the Motherland! Yippee! !